In October 1973, "Control", head of British intelligence (referred to as "The Circus"), sends agent Jim Prideaux to Budapest to meet a Hungarian general wishing to defect. Prideaux is shot. Amidst the international incident that follows, Control and his right-hand man George Smiley are forced into retirement. Control dies of illness shortly afterward. Smiley's wife Ann is having an affair with his colleague Bill Haydon and has moved out. Percy Alleline becomes the new Chief, Bill Haydon his deputy, and Roy Bland and Toby Esterhase his lieutenants. Despite Control and Smiley's misgivings, their successors had already begun a secret operation—"Witchcraft"—to obtain highly sensitive information from the Soviet Union, which is in turn being traded with the CIA for American intelligence. Smiley is enlisted by Cabinet Office civil servant Oliver Lacon to investigate a claim by Ricki Tarr, a British spy, that for years there has been a mole in a senior role in the Circus, a suspicion that Control had held too, but had not shared with Smiley. Smiley chooses a trustworthy agent, Peter Guillam, and retired Special Branch officer Mendel to help him. He interviews former Circus analyst Connie Sachs, who was sacked by Alleline after she deduced that Alexei Polyakov, a Soviet cultural attaché in London, was a spy. Tarr tells Smiley that on an assignment in Istanbul, he had an affair with Irina, a Soviet agent. She wanted to reveal the name of a mole in the top ranks of the Circus but when Tarr reported this to London, they ignored him and ordered him straight home, while the Soviets promptly kidnapped Irina. Concluding that the mole had intercepted his message, Tarr went into hiding, suspected of defecting and murdering the British station chief. Smiley sends Guillam to steal the Circus logbook for the night Tarr had called and finds the pages for that night have been cut out, supporting Tarr's story. Smiley discovers that Prideaux is alive, having been exchanged with the Soviets after a period of brutal interrogation, and is living a life of solitude as a school teacher. Smiley interviews Prideaux, who reveals that the true purpose of the mission to Hungary was to get the name of the mole. Control had codenamed the suspects "Tinker" (Alleline), "Tailor" (Haydon), "Soldier" (Bland), "Poorman" (Esterhase), and "Beggarman" (Smiley). Smiley learns that Alleline, Haydon, Bland, and Esterhase have been meeting Polyakov—the "Witchcraft" source—at a safe house somewhere in London, where Polyakov gives them supposedly high-grade Soviet intelligence, in exchange for low-grade British material to help him maintain his cover with the Soviets. However, the mole is actually passing substantive material, including American intelligence, to Polyakov, his handler, whilst Polyakov's material has just enough substance to persuade the CIA to share information with the British. Smiley blackmails Esterhase with a threat of deportation to get the safe house's location. Smiley then has Tarr appear at the Paris office, implying he knows who the mole is. The mole is revealed to be Haydon when he meets Polyakov at the safe house, where Smiley captures him. The Circus plans to exchange Haydon with the Soviets but he is killed by Prideaux. Smiley returns to the Circus as its new chief. He comes home to find Ann having returned to him. The project was initiated by Peter Morgan when he wrote a draft of the screenplay, which he offered to Working Title Films to produce. Morgan dropped out as the writer for personal reasons but still served as an executive producer. Following Morgan's departure as writer, Working Title hired Peter Straughan and Bridget O'Connor to redraft the script. Park Chan-wook considered directing the film, but ultimately turned it down. Tomas Alfredson was confirmed to direct on 9 July 2009. The production is his first English language film. The film was backed financially by France's StudioCanal and had a budget corresponding to $21 million. The film is dedicated to O'Connor, who died of cancer during production. 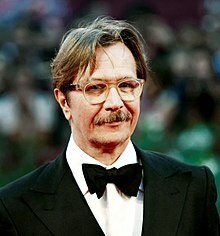 The director cast Gary Oldman in the role of George Smiley, and described the actor as having "a great face" and "the quiet intensity and intelligence that's needed". Many actors were connected to the other roles at various points, but only days before filming started, Oldman was still the only lead actor who officially had been contracted. David Thewlis was in talks for a role early on. Michael Fassbender was in talks at one point to star as Ricki Tarr, but the shooting schedule conflicted with his work on X-Men: First Class; Tom Hardy was cast instead. On 17 September 2010, Mark Strong was confirmed to have joined the cast. Jared Harris was cast but had to drop out because of scheduling conflicts with Sherlock Holmes: A Game of Shadows; he was replaced by Toby Jones. John le Carré appears in a cameo as a guest in a party scene. Principal photography took place between 7 October and 22 December 2010. 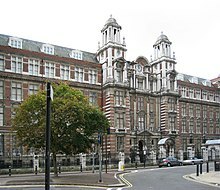 Studio scenes were shot at a former army barracks in Mill Hill, North London. Blythe House in Kensington Olympia, West London, was used as the exterior for "The Circus." The interior hall of Budapest's Párizsi Udvar ("Paris Court") served as the location for the café scene, in which Jim Prideaux is shot. Empress Coach Works in Haggerston was used as the location for the Merlin safe house. Other scenes were filmed on Hampstead Heath and in Hampstead Ponds, where Smiley is shown swimming, and in the physics department of Imperial College London. The events which take place in Czechoslovakia in the novel were moved to Hungary, because of the country's 20% rebate for film productions. The teams filmed in Budapest for five days. Right before Christmas, the team also filmed in Istanbul for nine days. The production reunited Alfredson with cinematographer Hoyte van Hoytema and editor Dino Jonsäter, with whom he had made his previous film Let the Right One In. The film took six months to edit. The final song in the film, Julio Iglesias' rendition of the French song "La Mer", set against a visual montage of various characters and subplots being resolved as Smiley strides into Circus headquarters to assume command, was chosen because it was something the team thought George Smiley would listen to when he was alone; Alfredson described the song as "everything that the world of MI6 isn't". A scene where Smiley listens to the song was filmed, but eventually cut to avoid giving it too much significance. Heard at a Circus office party, sung along to by the guests, is "The Second Best Secret Agent in the Whole Wide World", composed by Sammy Cahn and Jimmy Van Heusen, and performed by Sammy Davis, Jr., from the British spy spoof Licensed to Kill (1965). At the same office Christmas function, the Circus staff sing the official "State Anthem of the USSR", conducted by a figure dressed as Father Christmas but wearing a Lenin mask. The film premiered in competition at the 68th Venice International Film Festival on 5 September 2011. StudioCanal UK distributed the film in the United Kingdom, where it was released on 16 September 2011. The US rights were acquired by Universal Pictures, which have a permanent first-look deal with Working Title, and they passed the rights to their subsidiary Focus Features. Focus planned to give the film a wide release in the United States on 9 December 2011 but pushed it to January 2012, when it was given an 800 screen release. Tinker Tailor Soldier Spy received generally positive reviews. The film scored 83% on Rotten Tomatoes, based on 220 reviews, with an average rating of 7.8/10. The site's summary called the film "a dense puzzle of anxiety, paranoia, and espionage that director Tomas Alfredson pieces together with utmost skill". Metacritic, which assigns a normalised rating in the 0–100 range based on reviews from top mainstream critics, calculated an average score of 85 based on 42 reviews, indicating "universal acclaim". Jonathan Romney of The Independent wrote, "The script is a brilliant feat of condensation and restructuring: writers Peter Straughan and the late Bridget O'Connor realise the novel is overtly about information and its flow, and reshape its daunting complexity to highlight that". David Gritten of The Daily Telegraph declared the film "a triumph" and gave it a five star rating, as did his colleague, Sukhdev Sandhu. Stateside, Peter Travers of Rolling Stone wrote, "As Alfredson directs the expert script by Peter Straughan and Bridget O'Connor, the film emerges as a tale of loneliness and desperation among men who can never disclose their secret hearts, even to themselves. It's easily one of the year's best films." M. Enois Duarte of High-Def Digest also praised the film as a "brilliant display of drama, mystery and suspense, one which regards its audience with intelligence". Detractors of the film included Peter Hitchens of The Mail on Sunday, who wrote that the plot would be too baffling for viewers who had not read the book, and that the film's makers had "needlessly messed it up". David Edwards of the Daily Mirror wrote, "The big question – and one le Carré himself asked when the film was announced – is whether such a hefty novel can fit comfortably into a feature-length production. In answering this, the writers have pared things back, meaning it's far pacier than the seven-part TV show. Unfortunately, the plot is every bit as bewildering with an overload of spy-speak, a few too many characters to keep track of and a final act that ends with a whimper, rather than a bang." The Telegraph's Guy Stagg, meanwhile, thought that the movie needed a car chase in the middle. Writing in The Atlantic, le Carré admirer James Parker favourably contrasted Smiley with the James Bond franchise but found this Tinker Tailor adaptation "problematic" compared to the 1979 BBC mini-series. He wrote: "To strip down or minimalize le Carré, however, is to sacrifice the almost Tolkienesque grain and depth of his created world: the decades-long backstory, the lingo, the arcana, the liturgical repetitions of names and functions". The film topped the British box office chart for three consecutive weeks and earned $80,630,608 worldwide. While doing press for Working Title's Les Misérables film adaptation, producer Eric Fellner stated that fellow producer Tim Bevan was working with writer Straughan and director Alfredson on developing a sequel to Tinker Tailor Soldier Spy. Fellner did not specify whether or not the sequel would be based on The Honourable Schoolboy or Smiley's People, the two remaining Smiley novels in Le Carré's Karla trilogy. While doing press for Dawn of the Planet of the Apes in 2014, Oldman stated that talk of a sequel, an adaptation of Smiley's People, had since disappeared; while also stressing that he would still like to see the film produced. However, in July 2016 Oldman confirmed that the sequel was in its early stages, stating, "There is a script, but I don't know when we will shoot." ^ Radish, Christina (14 October 2010). "Screenwriter Peter Morgan Exclusive Interview". Collider. Retrieved 21 October 2010. ^ Lee, Rachel (29 March 2012). "Park Chan-wook stalks a thriller with 'Stoker'". Korea JoongAng Daily. Archived from the original on 12 July 2012. Retrieved 17 April 2012. ^ de Semlyen, Phil (9 July 2009). "Tomas Alfredson to Direct Tinker, Tailor". Empire. Retrieved 26 September 2011. ^ "Tomas Alfredson to direct Tinker, Tailor, Soldier, Spy". Screen Daily. 9 July 2009. Retrieved 26 September 2011. ^ a b c Tutt, Louise (8 December 2011). "How to tailor a spy classic". Screen International. Retrieved 11 December 2011. ^ Hoskin, Peter; Mason, Simon (23 October 2010). "Interview – Tomas Alfredson: outside the frame". The Spectator. Archived from the original on 1 June 2011. Retrieved 23 March 2011. ^ White, James (8 July 2010). "Cast Confirmed For Tinker, Tailor". Empire. Retrieved 26 September 2011. ^ Goldberg, Matt (3 September 2010). "Tom Hardy Replaces Michael Fassbender in Tinker, Tailor, Soldier, Spy". Collider. Retrieved 26 September 2011. ^ Anderton, Ethan (17 September 2010). "Mark Strong Lands a Role in 'Tinker, Tailor, Soldier, Spy'". FirstShowing. Retrieved 26 September 2011. ^ Goldberg, Matt (22 October 2010). "Jones Replaces Harris in Tinker, Tailor, Soldier, Spy; Hurt, Graham, Lloyd-Pack, Dencik, and Burke Join Cast". Collider. Retrieved 23 March 2011. ^ Solomons, Jason (20 August 2011). "Trailer Trash: John Le Carré makes a cameo at an MI6 Christmas party". The Observer. ^ "Tinker, Tailor, Soldier, Spy". Screenbase. Retrieved 23 March 2011. ^ Goundry, Nick (13 September 2011). "Tinker Tailor Soldier Spy films Cold War Europe in London, Budapest and Istanbul". The Location Guide. Retrieved 12 March 2012. ^ Ramachandran, Naman (7 December 2010). "Alfredson shoots 'Tinker, Tailor, Soldier, Spy'". Cineuropa. Retrieved 1 June 2011. ^ Gradvall, Jan (3 December 2011). "Tomas Alfredson: Jag avskyr intryck just nu". di.se (in Swedish). Retrieved 11 December 2011. Julio Iglesisas version av La Mer blir allt som MI6-världen inte är. ^ French, Phillip (17 September 2012). 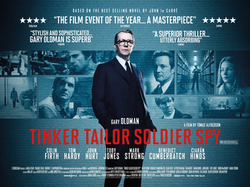 "Tinker Tailor Soldier Spy – review". The Guardian. Retrieved 6 February 2012. ^ "Venezia 68: Tinker, Tailor, Soldier, Spy – Tomas Alfredson". labiennale.org. Venice Biennale. Archived from the original on 27 August 2011. Retrieved 27 August 2011. ^ "Tinker, Tailor, Soldier, Spy". Screenrush.co.uk. Tiger Global. Retrieved 1 June 2011. ^ Brevet, Brad (29 August 2011). "Ugh, No 'Tinker, Tailor, Soldier, Spy' Until December". Retrieved 2 September 2011. ^ Staff (2011). "Tinker Tailor Soldier Spy". Rotten Tomatoes. Retrieved 24 November 2018. ^ "Tinker Tailor Soldier Spy". Metacritic. CBS Interactive. Retrieved 29 May 2012. ^ Romney, Jonathan (18 September 2011). "Tinker Tailor Soldier Spy". The Independent. London: INM. ISSN 0951-9467. OCLC 185201487. Retrieved 26 September 2011. ^ Gritten, David (5 September 2011). "Venice Film Festival: Tinker, Tailor, Soldier, Spy – first review". The Daily Telegraph. London. ISSN 0307-1235. OCLC 49632006. Retrieved 26 September 2011. ^ Sandhu, Sukhdev (15 September 2011). "Tinker, Tailor, Soldier, Spy – review". The Daily Telegraph. London. Retrieved 22 October 2011. ^ Travers, Peter (8 December 2011). "Tinker Tailor Soldier Spy". Rolling Stone. Retrieved 17 March 2012. ^ Duarte, M. Enois (20 March 2012). "Tinker Tailor Soldier Spy (Blu-ray)". High-Def Digest. Retrieved 20 March 2012. ^ Peter Hitchens (21 September 2011). "Tinker, Tailor, Soldier, Travesty". The Mail on Sunday. Retrieved 25 September 2011. ^ Edwards, David (16 September 2011). "Tinker Tailor Soldier Spy movie review: Thriller is impressive – but not so entertaining". Daily Mirror. London. ISSN 9975-9950. OCLC 223228477. Retrieved 26 September 2011. ^ Guy Staff. "Tinker, Tailor, Soldier, Spy would have been so much better with a high speed car chase". The Telegraph. Retrieved 29 March 2016. ^ Parker, James (December 2011). "The Anti–James Bond". The Atlantic. Retrieved 6 February 2012. ^ "Tinker, Tailor, Soldier, Spy: United Kingdom". Box Office Mojo. Amazon.com. Retrieved 14 October 2011. ^ "Tinker, Tailor, Soldier, Spy". Box Office Mojo. Amazon. Retrieved 14 October 2011. ^ Eng, David (20 June 2012). "2012 Amandaprisen, Norwegian Film Awards – nominations". Chino Kino. Retrieved 18 August 2013. ^ "The American Society of Cinematographers Nominates". The ASC. 11 January 2011. Archived from the original on 28 February 2012. Retrieved 15 January 2012. ^ Kilday, Gregg (3 January 2012). "Art Directors Nominate Movies as Different as 'Harry Potter' and 'The Girl with the Dragon Tattoo'". The Hollywood Reporter. Retrieved 15 January 2012. ^ "Amour vince il premio della critica di Borgogna". Film e dvd. Retrieved 18 August 2013. ^ "International Online Film Critics Poll unveil nominees". Flickering Myth. 1 December 2012. Retrieved 18 August 2013. ^ "International Online Film Critics Poll declares 3rd edition winners". Flickering Myth. 20 December 2012. Retrieved 18 August 2013. ^ "I vincitori del Premio Cinema Ludus 2012". cinemaitaliano.info. ^ Chitwood, Adam (11 December 2012). "Producer Eric Fellner Talks; Says Tomas Alfredson and Screenwriter Peter Straughan are Working on it "As We Speak"". Collider. Retrieved 11 December 2012. ^ "Keri Russell and Gary Oldman Talk DAWN OF THE PLANET OF THE APES". Collider. 26 April 2014. ^ "Gary Oldman to return in 'Tinker Tailor Soldier Spy' sequel". NY Daily News. 6 July 2016. Wikimedia Commons has media related to Tinker Tailor Soldier Spy (film).